Family owned & operated for 50 years! 16.9 oz. Local Estate - Ascolano & Manzanillo Blend has a nutty characteristic and possess citrus & artichoke notes with the Manz fruity taste. From frying to sauces, and sprinkling on salads and toast, the best I've ever had. But, it was the bouquet that originally won me over. on 4/22/2012 Best topping oil I have found. I discovered this oil at the Olive Pit on a trip about seven years ago. It has an amazingly light fruity flavor and is my favorite topping oil. 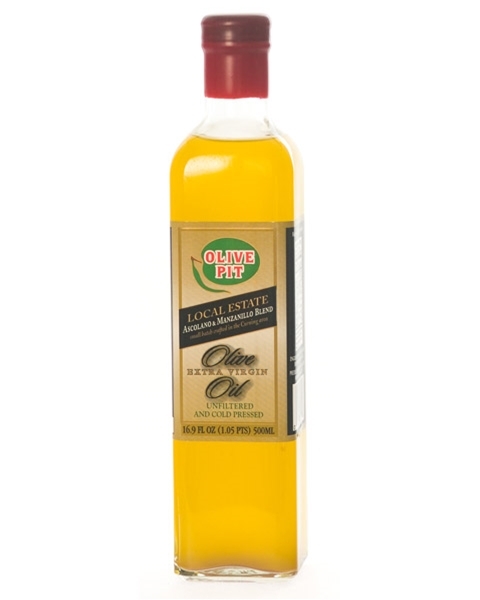 I have tried some other even more expensive oils from other brands but they all have a much heavier oily flavor so I keep ordering more of this wonderfully light and lively oil. Receive special promotions and updates!